The rails have cleaned to a bright finish but there is tarnishing to the rail sides. UK despatch only. Goods will be well protected. OO Gauge Hornby R615 Diamond Crossing (Nickel) . Condition is Used. Dispatched with Royal Mail 2nd Class Large Letter. Excellent quality Nickel Silver R615 diamond crossing. No broken sleepers, nearly as good as new. For sale l have a Hornby R 615 right hand diamond crossing. R8073 right hand points x 1. r606 curves x 1. HORNBY R615 DIAMOND CROSSING NICKLE SILVER RAILS,IN VERY GOOD CONDITION. HORNBY TRACK R615 DIAMOND CROSSING. Used. Condition is Used. Dispatched with Royal Mail 2nd Class. HORNBY R615 RIGHT HAND DIAMOND CROSSING LENGTH 168mm x 181mm ANGLE. NEW IN PACK. HORNBY R615. RIGHT HAND DIAMOND CROSSING LENGTH 168mm x 181mm ANGLE 22.5°. ©1998-2019, Westport Collectibles. Do not duplicate or redistribute in any form without prior consent. OO gauge Dimensions length 168mm x arc 22.5 degrees Not DCC Ready Track accessory Authentic Hornby product . Hornby Right-hand Diamond Crossing (R614). A staple of larger OO gauge layouts - a right-handed diamond crossing. This product is not suitable for children under 3 years. Handle with care. Any problems?. R615 Hornby Right Hand Diamond Crossing Length: 168mm Arc: 22.5 . Used model railways & collections always wanted. How it started; I have been interested in model trains since I was a child. It was more fun and much cheaper, now I can fix most locos so they run like new. All is new production. All is Nickel Silver On Steel. Diecast, Kits, Railway, Slot Racing and RC Specialists. Part Number: R615. Hornby points are supplied for operation by hand. We will always help you to have a 100% positive happy buying experience. Hornby 00 gauge diamond crossing right hand. Hornby R615 Right hand diamond crossing right-hand-diamond-crossing. Hornby R8014 Mark 2 Point Motor. Should these circumstances arise, we will notify you. © Hattons Model Railways. You might also like. HORNBY PART No R615. HORNBY :- RIGHT HAND DIAMOND CROSSING. More HORNBY available. Straight Lenght 168 mm & 180mm. New Hornby R615. Hornby R/H Diamond Crossing. We specialise in model railways and die-cast collectable models, both new and secondhand. Length 168mm x 181mm angle 22.5°. Approximate length: 168mm x 181mm, Angle: 22.5 degrees. A brilliant addition to any model railway. R8072 left hand points x 1. r8073 right hand points x 1. r614 left hand diamond crossing. r615 right hand diamond crossing. r606 curves x 2. Nickel Silver Rail. Herpa Model Cars and Trucks are for persons of age 14 (Warning Small Parts). Herpa Wings are for persons of age 14 (Warning Small Parts). 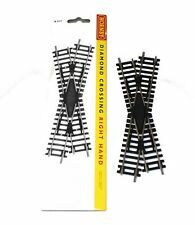 Hornby R615 Right Hand Diamond Crossing Straight Length 168mm & 180mm. Authentic Hornby product. A perfect new addition to your Hornby Collection! Not DCC Ready. Howleys Toys, 5 Frederick Place, Weymouth, Dorset. Hornby Right Hand Diamond Crossing. OO Gauge Abmessungen Länge 168mm x Bogen 22,5 Grad Nicht DCC bereit Zubehör verfolgen Authentisches Hornby Produkt . Hornby R615 Right Hand Diamond Crossing Straight Length 168mm & 180mm. A perfect new addition to your Hornby Collection! Suitable for 8 years Safety Information: Warning. Not suitable for Children under 3 years. UK despatch only. Goods will be well protected.